The core can be either stainless steel or inconel mesh. 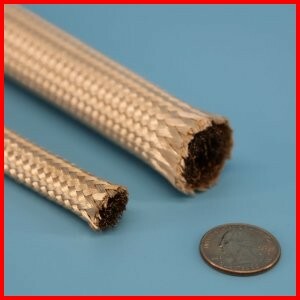 The heat treated version of the rope has a smooth braided shell made from filamant fiber yarn, providing an extremely clean and free of loose fiber outer shell, especially suited for applications such as paint shop booths where loose fibers are not tolerated, such as automotive assembly. Supplied cut to length, this metal mesh cored rope makes an excellent seal due to its compressability, and adds EMI/RFI protection to cabinets and enclosures.